Actions & events to celebrate Rev. Dr. Martin Luther King, Jr.
Home › Advocacy › Actions & events to celebrate Rev. Dr. Martin Luther King, Jr.
As we approach a day that commemorates the actions and ideas of the Rev. 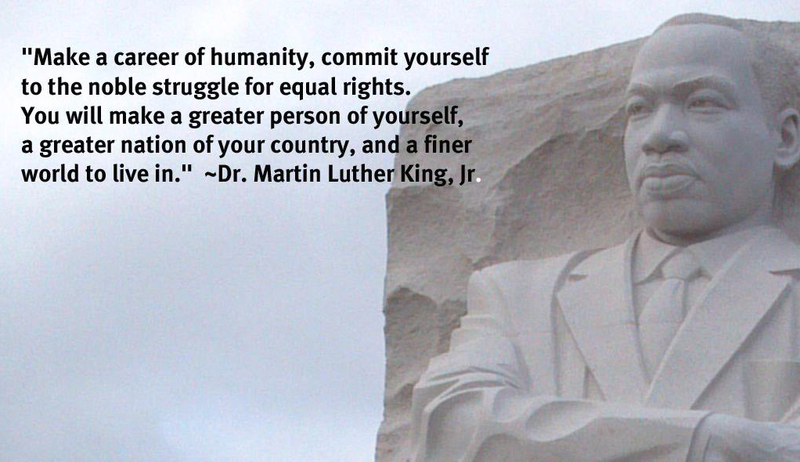 Dr. Martin Luther King, Jr., we pause to reflect on Dr. King’s dream. Dr. King’s dream was not limited to his March on Washington speech, but was discussed throughout his career, and in many aspects. He recognized the need for the internal work necessary to the task of true integration. Work that, it seems, is only now becoming ‘mainstream.’ Work that, to this day, meets resistance. As we pause to reflect, Solid Ground acknowledges that, though the “Whites Only” signs have disappeared, and suffrage has been granted to U.S. citizens without regard to race, the “difficult and less glorious” work of true integration has yet to be achieved. As we continue to forge a path forward, we also acknowledge the value of service in that work. To that end, we would like to highlight a number of opportunities for service on Martin Luther King, Jr. Day, Monday, January 21, 2019. First, we want to highlight Solid Ground’s own advocacy efforts, through its advocacy partner Poverty Action, which will be hosting their annual MLK Lobby Day event. Free transportation will be provided to Olympia from Solid Ground (1501 N 45th St, Seattle WA 98103), and will be leaving at 7am. Other transportation options are also available; please inquire by phone (Omar Cuevas Vega 206.694.6867. They will provide breakfast, lunch, childcare, and training on how to speak to your legislators. For those that are not able to attend the event, you can still support by calling your legislator directly. Next, we have a list of other opportunities compiled from web resources. Please reach out to directly to the associated organization for any information on the respective listings. All events are free, unless otherwise noted. Brief description: United Way’s Day of Service offers a number of service projects, throughout the Puget Sound region. Check their website for details, and to sign up. Brief description: Keynote speakers, film screenings, performances, children activities. Brief description: Workshops, march, rally, and lunch. Brief description: Day of service at various locations. Brief description: Reforest areas of Seward Park. Brief description: Morning program for families, children, and youth, and an evening program of music, dance, and arts. Celebrate the Rev. Dr. Martin Luther King Jr.
Time: 12:30 p.m. and 7:00 p.m.
Brief description: Lecture from Dr. Michael Benitez, Jr.
Brief description: Reclaim neighborhood green spaces. Brief description: Prepare for upcoming construction projects and preseason maintenance. Brief description: Celebration of Martin Luther King, Jr.
Brief description: Free admission to the museum, including a small panel exhibition about Dr. King’s visit to Washington State, and a performance by Ruby Bridges at 2:00 p.m.
Brief description: Help restore Woodland Creek Community Park’s riparian buffer and natural areas. Information in this post was compiled by the members of Solid Ground’s People of Color Caucus.